Jeff Bezos, the chief executive officer of Amazon. Jeff Bezos has never lived, gone to school, or worked here, so how much can he know about Boston? 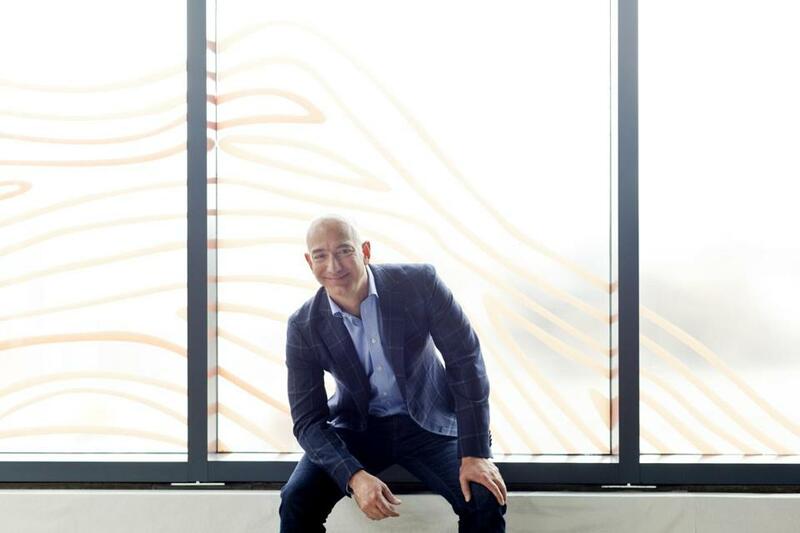 Since the founder of Amazon showed up to speak at a class at Harvard Business School in 1997, Bezos has invested in a handful of local companies — and bought others, sometimes pulling their leaders out to Seattle to work with him directly. He has overseen the growth of local Amazon offices, which now employ more than 3,000 techies and white-collar workers, separate from Amazon’s logistics operations and distribution centers in the state. Bezos has also invited a few dozen lucky academics, executives, and entrepreneurs from Boston to the exclusive conference he organizes annually in Palm Springs, Calif., to enjoy a “fireworks” display put on by drones or watch Bezos himself gleefully operate a huge Transformers-style exoskeleton. What impact — if any — will all of that have on Amazon’s eventual choice of a city for a second North American headquarters? Let’s just say it can’t hurt that Bezos has had plenty of direct exposure to Boston’s best and brightest. And those who have seen him in action say he appreciates brains and drive. Rodney Brooks, a Massachusetts Institute of Technology professor emeritus who once headed the university’s Computer Science and Artificial Intelligence Lab, has founded two robotics companies. Bezos invested in both: Bedford-based iRobot, now publicly traded, and Rethink Robotics, a private company in Boston making robots that can work in factories alongside humans. Brooks is one of the Bostonians who is on the invite list for Bezos’s annual conference — called MARS, which stands for machine learning, home automation, robotics, and space — and this year he showed off Rethink’s newest robot at the event. How is it different from other conferences? “Even if you pay a lot of money, you don’t get to go,” Brooks says. As Helen Greiner puts it: “If Bezos invites you to an event about robots, autonomy, and space in Palm Springs, I say you go.” Greiner was a co-founder of iRobot, with Brooks, and of the Danvers drone startup CyPhy Works. MARS, she says, is “very demo-oriented,” with lots of new products and research projects on display. One of Amazon’s first acquisitions, in 1998, was a local pre-Facebook social networking startup called Planet All. The co-founder of that company, Warren Adams, left Cambridge for Seattle to work at Amazon’s headquarters after Planet All was purchased in 1998. Adams wound up exploring things like the possibility that people might use a handheld device — at the time, a Palm VII digital organizer — to shop on Amazon. Bezos also asked Adams to think about how forthcoming tablet computers might be used to purchase, read, and store collections of books. That was about eight years before Amazon’s Kindle e-reader made its debut. Perhaps Bezos’s biggest link to Boston thus far has been his 2012 purchase of the warehouse robotics startup Kiva Systems. That North Reading company, now known as Amazon Robotics, builds the rolling machines that move merchandise in Amazon’s distribution centers, allowing it to more efficiently fill orders. Bezos is an occasional visitor to Amazon Robotics. Amazon also develops much of the speech recognition technology for its Echo intelligent speaker at a research and development site in Cambridge. And the company relies on Cambridge-based E Ink to supply the screens for its Kindle line of electronic books. E Ink’s co-founder and longtime chief executive, Russ Wilcox, remembers his one face-to-face meeting with Bezos, the company’s biggest customer. The Amazon CEO wasn’t exactly happy that there was just one company he could purchase the screens from, but no one else had developed a comparable technology. That, says Wilcox, may be exactly what Bezos is doing by creating a second headquarters city for Amazon. No one locally who has dealt with Bezos had a strong take on which North American city would win the headquarters crown — only that Bezos and his leadership team will be extremely analytical about evaluating their options. Some of Bezos’s first visits to Boston, after he founded Amazon, were to drop in on a class at Harvard Business School taught by Jeffrey Rayport, who had written a case study about the then-fledgling business. It was the late 1990s, and the company was on the verge of its Nasdaq stock market debut. But Bezos was still feeling frugal. He didn’t want to spring for a cab from Logan to the Harvard campus, so some MBA students vied to give him a lift. Two of them, Rayport recalls, were promptly hired to work at Amazon — they helped the company add DVDs and consumer electronics devices to Amazon’s online storefront. Bezos has gotten to know Boston pretty well over in the years since those early visits. The big question now: Will Boston get to know Bezos better?